Screen fine, fluffy, attractive and nutritious compost and top soil at home. Sifted compost feeds your plants as it dresses up your beds with its beautiful texture. The screen aerates your compost and removes any lumps of material that are not "done". Remove pebbles and debris from garden soil for your very own supply of clean topsoil. Will give you a stone-free batch of garden soil or compost. Plus, this sifter will shake dirt from bulbs and roots, which is much easier and faster than doing it by hand. 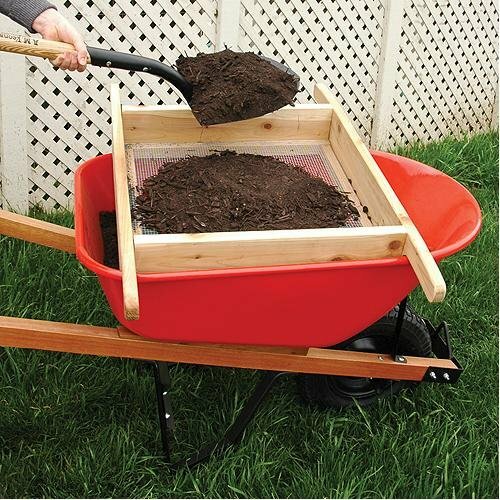 The perfect size to screen material right into your wheelbarrow. Made of 1" thick cedar to withstand serious use.